Albert P. Crary Science and Engineering Center, McMurdo Station. 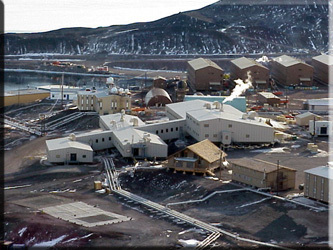 The Albert P. Crary Science and Engineering Center at McMurdo Station was dedicated in November 1991. The laboratory is named in honor of geophysicist and glaciologist Albert P. Crary (1911-1987), the first person to set foot on both the North and South Poles.The laboratory contains state-of-the-art instrumentation to facilitate research and to advance science and technology. It contains modern personal computers and workstations, a computer-based geographic information system (GIS), and a local area network. It has laboratory space, analytical instrumentation, and staging areas for a wide range of scientific disciplines. The laboratory also supports special activities, including environmental monitoring, snow and ice mechanics, and meteorology. The facility replaces outdated science buildings that were built as early as 1959. The Crary Lab has five pods built in three phases to make 4,320 square meters of working area. Phase I has a two-story core pod and a biology pod. Phase II has earth sciences and atmospheric sciences pods. Phase III has an aquarium.